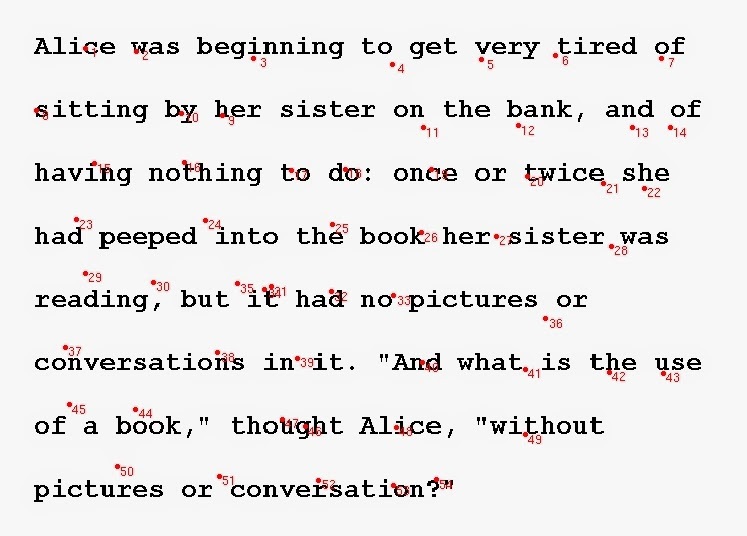 Word separation increases reading efficiency because skilled readers process text word by word, not letter by letter (or character by character, in nonalphabetic writing systems). When we read, our eyes do not scan each line of text smoothly, but hop across the line in little jumps called saccades. After each saccade, the gaze stops on the text in a fixation. It is as if we were reading in a series of snapshots. Each fixation gathers visual information from the perceptual span, the number of symbols we can pay attention to in one snapshot, and the brain processes this information as the eyes jump to the next fixation. It has been found, too, that some saccades jump backward. This is not completely understood, but it is reasonably thought to occur when the reader’s attention has been disturbed or when something doesn’t make sense, and the eye moves back to previous information in order to re-process it. Reverse saccades slow down the pace of reading. Saenger mentions these physiological processes in Space Between Words, although he was relying on research from the 1970s and 1980s that is now largely outdated. The ‘word shape’ theory of word recognition is not now generally held. It can be shown, for example, that the type of font being read (variable-width vs fixed-width) does not affect the perceptual span, and mixing lower- and upper-case letters does not seem to have a significant effect on reading efficiency either. Skilled readers of alphabetic writing, such as the Roman alphabet used for English, do not rely on a ‘Bouma shape’ to read words, but apparently recognise the letters as abstractions and process them in chunks of at least four letters at a time (for modern English, anyhow). There is considerable debate over whether this processing is ‘parallel’ or ‘serial’ and to what extent the sound of the letters or words (‘phonological coding’) is involved in the processing, but we’ll leave those issues for another time. The average forward saccade for a modern skilled reader of English moves about 7-9 letter spaces to the right, and the optimal fixation point is somewhere between the beginning and the middle of a word. Readers of writing systems in scriptio continua, such as Thai, use cues such as predictable character clusters at word boundaries to target fixations. But a more effective cue for eye movements is the addition of spaces at word boundaries. Saenger has identified an important intermediate stage between scriptio continua and canonical word separation; he calls this ‘aeration’ and it is characterised by the insertion of spaces at word or morpheme boundaries, but not consistently between what we would consider ‘words’. The result is text that is partially word-separated by space. London, British Library MS Cotton Augustus II.2. Image: British Library. The earliest precisely datable example of English writing, for example, is this charter of King Hlothhere of Kent, granting lands to the religious community of Abbot Beorhtwald in the year 679 (London, British Library MS Cotton Augustus II.2), Sawyer 8. Part of the Latin text reads, after the opening heavily abbreviated formula, as follows: ego Hlothariusrex Cantuariorum proremedium animaemeae donoterram . . . If we spaced a modern English translation the same way, it would look something like this: ‘I Hlothereking oftheKentish forthesalvation ofmysoul givetheland . . .’ The effect is not as jarring in Latin, which has fewer separate function words than modern English. Furthermore, the placement of a space after every 10-13 letters would have been, as Saenger suggests, of some help to the reading eye in targeting its saccades, probably allowing the reader to process a couple of Latin words at each fixation. Of course, a 7th-century scribe would not have known anything about the results of 21st-century eye tracking studies, so we cannot say for certain how early medieval scribes discovered the advantages of adding spaces to written text. 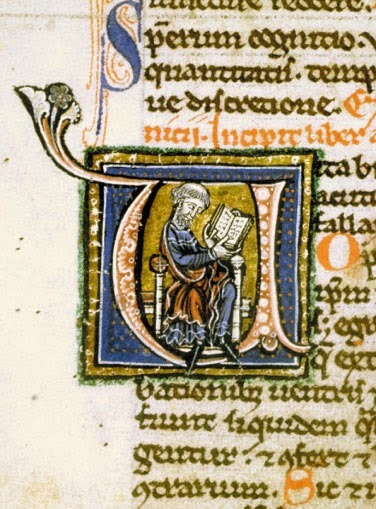 But scribes were readers too, and it is most likely that a 7th-century English reader of Latin habitually processed the text a couple of words at a time in his mind – Latin was a foreign language to him, and he would have been taught to analyse Latin words grammatically in order to understand them – so that it might have been natural to write out a Latin text in little clumps of a couple of words at a time. From this stage it is perhaps not much of a stretch to canonical word separation, where all word boundaries are marked by space. 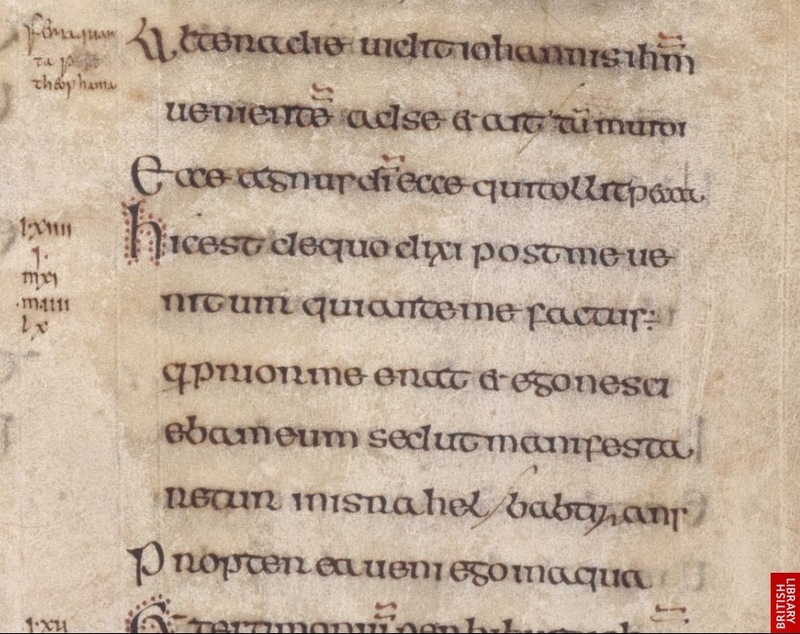 Compare the same text from a manuscript written in England, about three hundred years later, in the first quarter of the 11th century, the ‘Grimbald Gospels’, in the wonderful hand of the Canterbury scribe Eadui Basan. Not only do we have clear canonical word separation, but a system of punctuation using points. London, British Library MS Additional 34890, fol. 116r. Image: British Library. Modern eye-tracking studies test reading conditions that are quite different from those of early medieval England: they typically test skilled readers with printed text in a language in which they are fluent. For modern readers in that situation, reading has become habitual and the physiological and cognitive processes are usually taken for granted; we don’t think about reading when we read. But early medieval readers were in a different situation. They were reading handwritten text, without eyeglasses or artificial light, and in England it was usually in a language they did not normally speak and that they had to be trained to decode. Under these circumstances, I wonder if anyone noticed that putting spaces between words not only made the text easier to parse grammatically and translate from Latin to English, but was possibly less fatiguing for the eyes and certainly made it possible to read more rapidly. What we do know is that word separation by space took some time – measured in centuries, not years – to be widely adopted, and the full range of its advantages may not have been immediately appreciated. Saenger’s argument is most fully presented in Paul Saenger, Space Between Words: The Origins of Silent Reading (Stanford: Stanford UP, 1997). Recent research on the cognitive psychology of reading, particularly with respect to eye tracking studies, is helpfully summarised in Charles A. Perfetti, ‘Comprehending Written Language: A Blueprint of the Reader,’ in The Neurocognition of Language, ed. Peter Hagoort and Colin M. Brown (Oxford: Oxford UP, 1999), 167–208; Keith Rayner, Barbara J. Juhasz, and Alexander Pollatsek, ‘Eye Movements During Reading,’ in The Science of Reading: A Handbook, ed. Margaret J. Snowling and Charles Hulme (Malden, MA: Blackwell, 2005), 79–97; and especially Keith Rayner and Alexander Pollatsek, ‘Basic Processes in Reading,’ in The Oxford Handbook of Cognitive Psychology, ed. Daniel Reisberg (Oxford: Oxford UP, 2013), 442–461. On reading Chinese and Thai, see Ronan Reilly and Ralph Radach, ‘The Dynamics of Reading in Non-Roman Writing Systems,’ Reading and Writing 25.5 (2012): 935–950; Tong Li and Catherine McBride-Chang, ‘How Character Reading Can Be Different from Word Reading in Chinese and Why It Matters for Chinese Reading Development,’ in Reading Development and Difficulties in Monolingual and Bilingual Chinese Children, ed. Xi Chen, Qiuying Wang, and Yang Cathy Luo, vol. 8 (Dordrecht: Springer Netherlands, 2014), 49–65; and Benjawan Kasisopa et al., ‘Eye Movements While Reading an Unspaced Writing System: The Case of Thai,’ Vision Research 86 (2013): 71–80. Preliminary research for this study was contributed by Medieval Codes team member Jennifer Mainprize, although she is not at all responsible for anything silly I might have written in this post or others. I don't buy "...the full range of its advantages may not have been immediately appreciated." As noted earlier in the post, adding spaces improves reading speed even for adults who have been reading mostly scriptio continua their entire lives; not surprising, as cognitively an invariant cue like spaces is indisputably less demanding than a variable cue like character clusters. Why would a development (adding spaces) that markedly reduced cognitive workload NOT be immediately appreciated? I would reframe the last sentence of the post as: Why would adoption of word separation take so long--centuries--when there can be little doubt that its advantages would be immediately appreciated? Those are very good questions. You are right, the very fact that word separation by space was adopted implies that scribes considered it advantageous in those circumstances. But what would medieval scribes and readers have considered advantageous? Would faster reading speed, or reduced cognitive workload, be seen as advantages? If you could point me to any direct statements by medieval writers about the benefits of word separation by space, I'd be grateful. In any case, thank you for your comments.